The holy Prophet Elias (Elijah) was one of the two people, with Moses, who appeared to speak with Christ at the time of the Transfiguration on Mount Tabor before Christ’s disciples Peter, James, and John. He was, by his many miraculous deeds given by God, a truly great prophet. He raised the dead, brought fire down from Heaven, blessed meal and oil to multiply and never diminish for years, and traveled for forty days and nights on a single meal given by an angel. He, like Moses, was able to see God pass by while in a cave on the Holy Mount Horeb, halfway up Mount Sinai, and knew Him in a still small voice. When his first earthly ministry was finished while living his life for God in the ninth century before Christ, God took him up bodily into Heaven in a fiery chariot before the eyes of his disciple, the Prophet Elisha, to whom he threw his mantle as he was ascending upwards. By this mantle Elisha received a double portion of miraculous grace of which he had asked Elias. 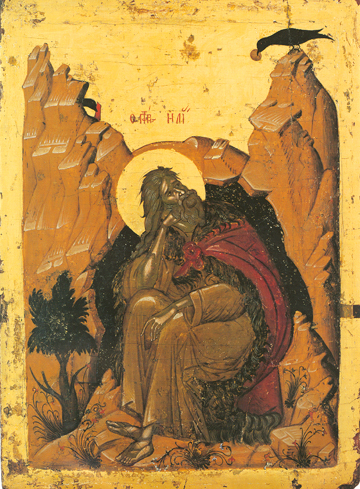 In this icon the Prophet Elias sits in a cave, in the wadi from Jerusalem to Jericho, where God sent a raven to feed him with bread.